The Epithelium separates body compartments as a barrier and selectively transports various substances, thereby contributing to various functions of organs and homeostasis. Our laboratory aims to clarify the molecular bases of specialized cell structures that are responsible for these basic roles of the epithelium. We focus on the cell-cell junctions involved in the regulation of paracellular transport (occluding junctions), including the tight junction and its related structures, and examine their molecular architectures, functions and dynamic behavior. One of the characteristic features of our research is that we identify structural or regulatory proteins of occluding junctions in our hands and characterize them. We take combined approaches of molecular biology, physiology and morphology, including immunoelectron and freeze-fracture electron microscopy, by using cultured epithelial cells and model organisms, including the mouse and fruit fly. Recent development of genome editing techniques have enabled us to perform convincing loss-of-function analyses of the proteins of our interests in cultured epithelial cells. The following are ongoing projects. 1. Elucidation of the molecular mechanism behind the diversity of the morphology and function of tight junctions. 2. Molecular dissection of tricellular tight junctions and elucidation of their physiological functions. 3. Elucidation of the regulatory mechanism of cell-cell junction formation by using Drosophila genetics. 4. Elucidation of the molecular mechanism behind the polarity formation of epithelial cells. 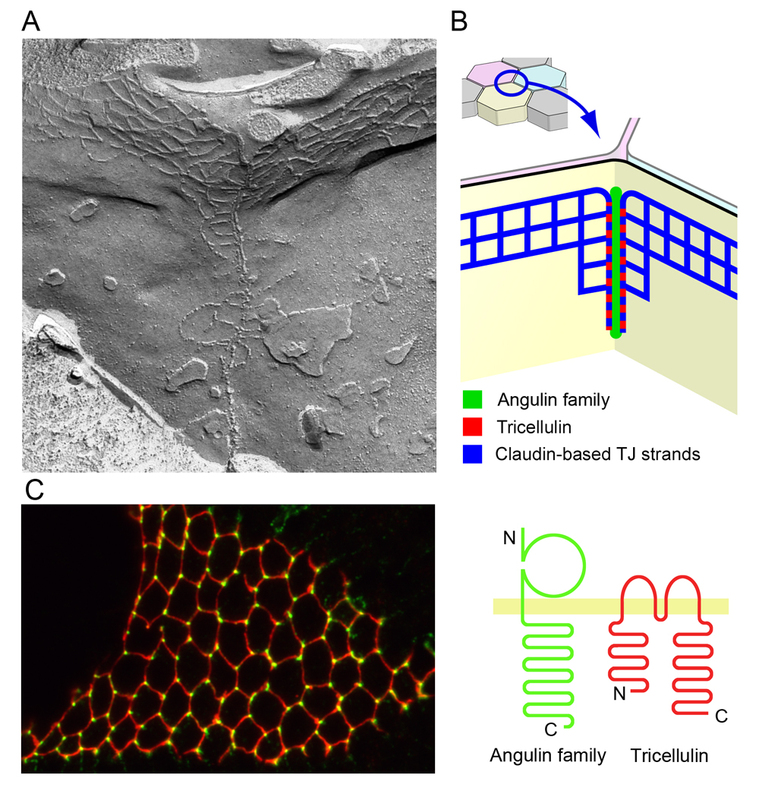 Morphology and molecular architecture of tricellular tight junctions. A. A freeze-fracture electron micrograph of tricellular tight junctions in mouse intestinal epithelial cells. B. A model of the molecular organization of tricellular tight junctions. C. An ultra-thin section electron micrograph of tricellular tight junctions in cultured epithelial cells. D. Localization of angulin-1/LSR (green) and occludin (red) in a frozen section of the mouse epididymis by immunofluorescence staining.